In 35 years of hiking all over the Pacific Northwest, I have not feared those I meet on trails. Any one who hikes miles and climbs mountains is probably not intent on crime. I trust fellow hikers’ motives for being there. We are all testing ourselves against nature, enjoying solitude and the oxygen high that comes from pure air and rushing streams. In the decades of my 50’s, 60’s and 70’s, I have ventured out alone as needed to research hikes for Hiking Washington’s History. Physically, I’m no match for a bigger, stronger protagonist with a gun, but those are not the people I encounter on trails. They’re more likely to be a group of retirees enjoying relative hiking freedom and solitude on a Tuesday. I have also hiked for eight hours in southeastern Washington and encountered only foxes and elk. My biggest concern has been whether my car would break down on a pot-holed Forest Service road. Until I learned that a teenage girl had chosen the park as the place to end her life, near a waterfall. I could not run or walk there again without thinking that to this girl it was a place she could be away from people who might have tried to save her, a kind of solitude that is not healthy. 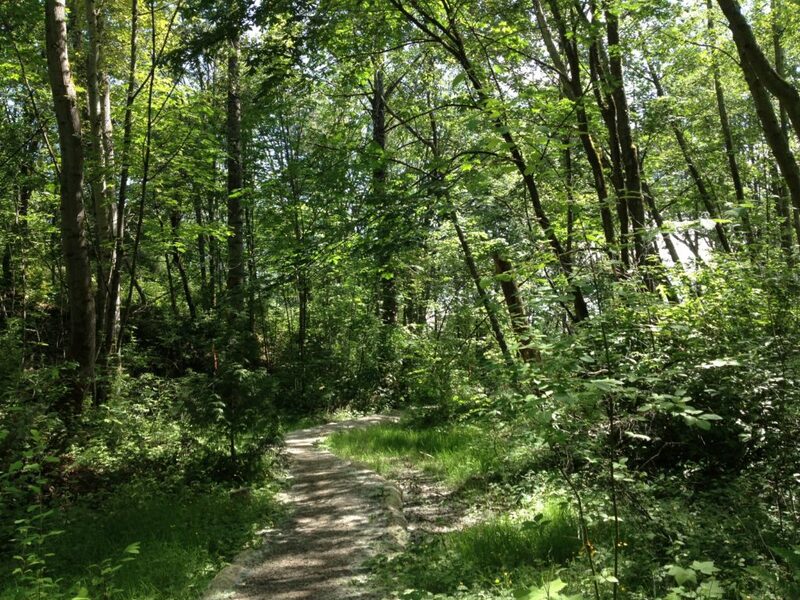 We moved a few years later from Bellevue to Seattle where I have been active in the West Duwamish Greenbelt Trails group, which promotes hiking in the largest contiguous forest in Seattle. The 500-acre greenbelt on a ridge above the Duwamish Waterway is bordered by houses, a community college, and an elementary school. Our goal as a group is to encourage people to use the maintained trails in the greenbelt. We want people to feel at home in the forest, within a few minutes of city life. Urban parks can be a haven—a place to get away from social pressures of congested living; a place to hear birds, find mushrooms, even watch ducks on a pond, a place to be alone without relating to others. The natural threats in the greenbelt are few. Cougars roamed the ridge above the Duwamish River centuries ago but no more. Strong winds may fell trees across the trail, but windy days can be avoided. Human threats are a bit less predictable. Parks are rightly a common space, where anyone can go. When I wanted to take my young grand-daughters on a walk in the woods in north Seattle, I was warned to expect illicit activity. The same is true of Herring’s House Park on the Duwamish River, a place I would like to send students in search of native history. Students at South Seattle College “take a walk in the greenbelt” for a pot break. Homeless people stake out territory there, seeking refuge but also deterring others’ use of the trails by their presence and sometime drug dealing. Last summer, a young man ran to the greenbelt after he had tried to murder his ex-girlfriend. The college went on lock-down, and a regular Friday group hike was canceled. As police tracked him down, the man shot himself. The violence tainted my hopes for the greenbelt as a place of refuge and calm. For this young man, it was a place he could end his angry life. The police wound yellow tape around the scene. Even as I write this, another person has ended his or her life in the forested park just a block from where I live in Seattle. These urban and suburban green spaces attract both those seeking health and solitude and those who are desperate. Conversely, the human perils of the wilderness are rare: a woman and daughter were killed near a popular trailhead in western Washington; a woman bending over to get something out of her pack was shot by a young hunter who thought she was a bear. Both were shocking but the only trail deaths by human violence I know about in western Washington. How can we feel safe in both urban parks and the wilderness? I still feel safe in the wilderness and I still hike urban trails—but not alone. Runners, dog walkers, even mountain bikers—the more people using the parks at many hours of the day, the better. Solitude may have to be sacrificed to safety in the city, making the lure of the great outdoors even stronger. I’m not willing to give up either place. At its best, a forest–in the city or the mountains–connects us to a larger, more enduring world. Great rocks and mountains don’t move unless the whole earth shakes. The Duwamish people say the spirit and the very dust of their ancestors is in the soil, in the trees above the Duwamish River. We are small players; our heartbreaks and defeats are fleeting in the company of elders, both human and natural.